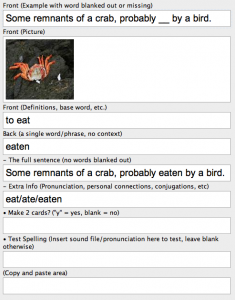 Once you’ve built a foundation with several hundred simple vocabulary cards, you can use these flashcards to teach you verb conjugations, adjective/noun inflections, etc. You’ll be learning these word forms in the context of example sentences with pictures (and without memorizing translations), which will help them stick in your memory. 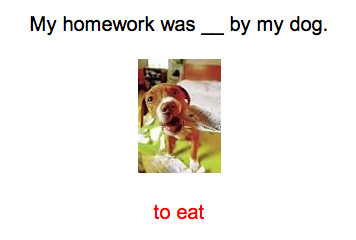 An example sentence in your target language that you understand, usually through the help of a translation. In the beginning, I generally get these from my grammar book, since those sentences have been hand-picked, translated and come with a nice explanation of the grammatical concepts within them. 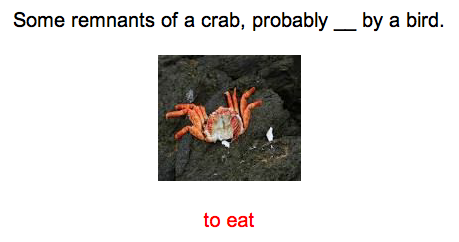 I don’t mind the use of translations here, as long as you don’t include them in your flashcards. 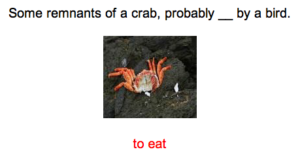 Pictures that somehow relate to the content of your example sentence. 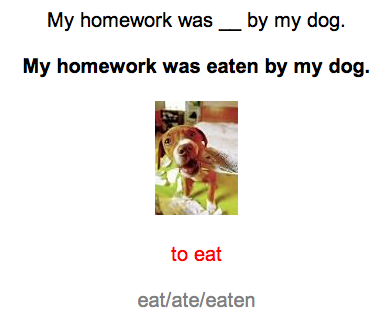 If you’re learning a sentence like “My homework was eaten by my dog,” you could grab a picture of homework, a guilty dog, an angry teacher, a student, a classroom, etc. It’s not particularly important that you get a perfect picture for your sentence, just that you get some picture. I like to use the basic version of Google Images for this. 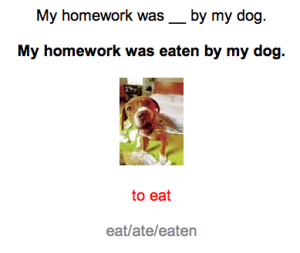 (Optional, but handy) Associated grammatical information for the word you’re learning – gender, conjugated forms, etc. 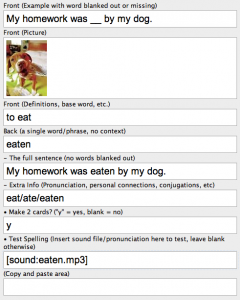 (Optional, and usually not necessary at this phase) A recording of the word you’re learning. I like to use Forvo.com. 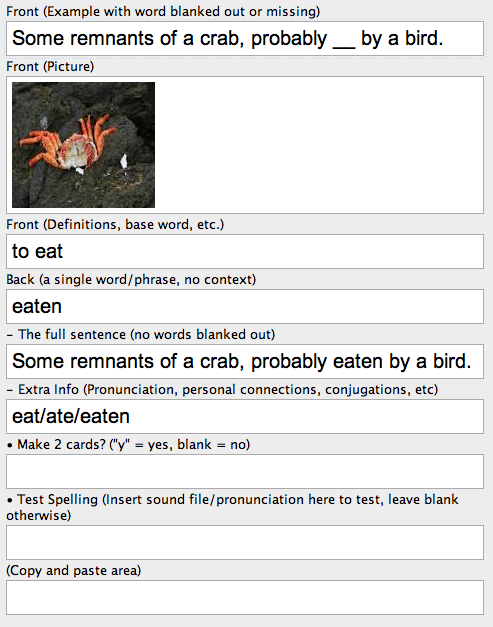 You should know how to add images to Anki flashcards. If you’re not confident at that, go to my tutorials on Anki. 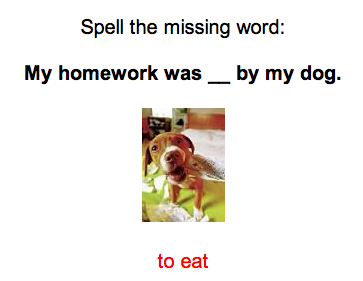 Note: Your goal here is to think of any example sentence or context in which this word word is used. If you happen to think of the one on the back side of the card, great. But if you think of a different one (“They got eaten by sharks”), that’s totally fine. Mark it as correct. Click the button on the top left, next to where it says “Type.” Select “3. All-Purpose Card” from the list And click “Choose” on the bottom right. Note that generally, I’d leave the “•Test Spelling” field blank, particularly for a word with a simple spelling like ‘eaten’. As a result, I’d only generate cards #1 and #2. 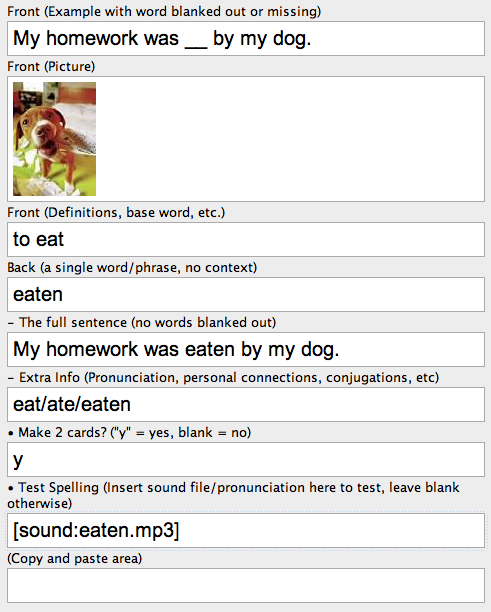 Click the “Add” button on the bottom to make flashcards #1, #2 and #4.